Jay Weatherill’s dirty diesel dozen: the actual solution to his power debacle. But for pride, arrogance and hubris SA’s vapid Premier, Jay Weatherill could have kept South Australia chugging away cheaply on coal-fired power for a paltry $30 million; the amount that Alinta wanted to keep its 520 MW Port Augusta power plant running for another five years or so. In a fit of petulance, Weatherill rejected that offer and, instead, determined to throw $550 million of taxpayers’ money at diesel fuelled jet engines (open cycle gas turbines, which can be run on diesel or gas) and a mega-battery delivered on time (but not without drama) by Californian carpetbagger, Elon Musk. The battery will go down as one of history’s most expensive political vanity projects, while the actual work will be done by his dirty diesels. Irony is an art form which requires a well-tuned intellect to detect. Apparently, the irony of blowing up a perfectly good coal-fired power plant to replace it with highly inefficient diesel fuelled jet engines is completely lost on the clowns that purport to run South Australia. Here’s another take on Weatherill’s wonderland from JoNova, which comes with an STT irony alert, for those so attuned. 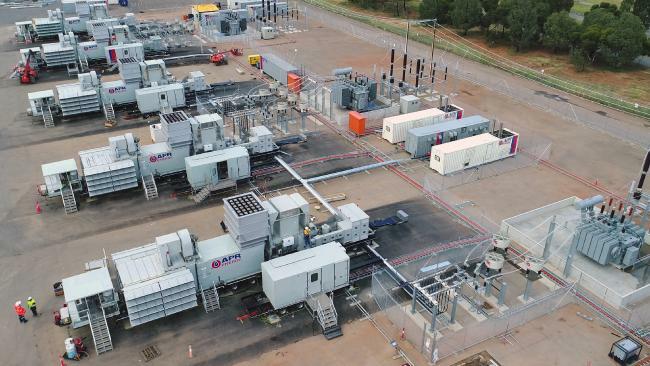 SA peak demand of about 2000 MW, so the world’s biggest battery can supply only 1.25% of the second smallest state in Australia, or 0.1% of the AEMO grid peak requirement. [And that’s only for four hours]. Enough diesel to power Jay’s jets for an hour or two. Also Wind Generators and Solar Panels and Huge Lithium batteries will be a nightmare to dispose of in a decade or so. Refer to my comment yesterday. Fine, you pay for it, and don’t look to us for subsidies, soft loans, mandates or targets. Now, tell us how to you power business, infrastructure, such as water and sewage, traffic lights etc, etc without a grid? If people wanted to generate and store their own power, they’d be doing it now, in droves. But, most people aren’t engineers, nor can they afford the kind of infrastructure you’re talking about. Most people – households and businesses – consider power an essential commodity, designed to be delivered, in bulk, on demand and at a price everyone can afford. Not just troughers who get subsidised panels and batteries and mandated feed in rates, 10 times the cost of what conventional power costs to generate and deliver, literally stealing from their neighbours. No one is stopping your hippy grid, but don’t expect those in the real world also want to destroy business and jobs by wrecking the system designed and built to power everyone and everything. I agree with your comments, however this forum only allows me to give short answers. It would be great if we could turn the clock back 50 years and start afresh, but that is impossible, so we must keep the extra high voltage grid system with all its faults. I don’t like wind farms because as we all know, they have their inherent problems and consume energy when not generating it. They will be very costly to maintain and already we are finding that noise pollution from them is a problem. Also, I have not seen any statistics for magnetic radiation and Cancer from the high current cables, that may cause Cancers in years to come – just like the magnetic effects from domestic appliances (electric cook tops etc) that should cause Cancer. We are the lucky country, because of our abundance of sunshine therefore if domestic users installed Solar and Battery storage we need not be reliant on this grid system, however gas would be needed for things like cooking and water heating unless the user installed larger Solar systems. Electric cook tops use large amounts of energy at peak times so this would relieve the pressure on the grid. We use it, then we should pay for it and be responsible for its disposal when it breaks down. In Australia we only have a small amount of Hydro potential which will only make it a quick fix unsustainable source of power into the future. Sadly nuclear seems to be our only solution to take us into the future with our population growth. So like ‘Edison’ when he invented the light bulb, all business’s wanted reticulated electricity to drive their machinery but the public fought against it because it was a killer, alas to no avail and industry won, but we all adapted to it over the decades. I think we currently need the grid system with all its faults to supply Industry and Public services until it can be phased out in a sensible manner, but we need to change our way of thinking about the way we use and abuse electricity, a way that will take us into the future with sustainability. You say ‘Sadly nuclear seems to be our only solution’. Why ‘Sadly’? Nuclear power provides reliable, affordable and CO2 emissions free electricity – there is nothing ‘sad’ about it. And we wouldn’t mind some direct answers to the direct propositions we put to you in our reply to your previous comment. Very well written putting things in context. Weatherill must be a buffoon owned by big business. I hope someone reads the emissions from the diesels. But most people are intimidated by people / mechanics with spanners and the area will be fenced off and under ” security “. David above is spot on too . Venezuela here we come ! this is what happens when you’re ignorant and arrogant to think you can force a premature change and make it work and don’t have the infrastructure in place to switch to a new power source. What ‘new’ power source are you talking about? Wind power, abadoned as soon as thermal energy was captured to create motive power? No country runs on wind power, SA proves that it’s impossible. And its battery wont make a scrap of difference. The article found in this link is another example of the tireless efforts of stakeholders (Green pollies, greedy investors, brainwashed millenials, left wing academics, inner city elitists, journalists etc etc etc) in perpetuating the myth of climate change. If they focused their energy on real environmental issues the planet would be all the better for it and we’d all still have jobs. The article reveals a clever but dangerous strategy – if these lies are not stopped the road to Venezuela is the one we are on. Another example of the madness that has taken control of Fairfax “journalists”. This is not the best example of Nicole Hasham’s green bias but she seems to have found a topic that gives her a good chance of getting published and thus paying her rent etc.